With the latest medical advances, it is now easier than ever to find out the father of an unborn child using a prenatal paternity test. Women and men no longer have to wonder about the father of an unborn child. In the past, paternity tests could only be run after the child had been born, using a blood sample. Now, postnatal tests can be done using saliva, blood, or other samples in order to determine paternity. For persons who need to know paternity during the gestational period, a Chorionic Villus Sampling (CVS) or amniocentesis can be administered in order to determine paternity. CVS involves taking chorionic villi from the baby's placenta. This can be done one of two ways. The first way involves using a transabdominal needle, where it goes through the mother's abdominal wall. The second way is through a transcervical needle, where a catheter goes through the cervix in order to collect a sample. Both of these procedures are guided by ultrasound, so that the chance of damage to the fetus and placenta are greatly reduced. Chorionic villi are then compared to a sample of DNA from the potential father to find a match. This test can be done as early as the first trimester. It usually takes anywhere from three to ten days, depending on the lab used, for results to come back. The amniocentesis test is usually done during the second trimester. It involves collecting amniotic fluid surrounding the placenta in order to compare with the potential father's DNA. Again, this is done using a needle through the mother's abdominal wall, guided by use of an ultrasound. These results can take up to two weeks to be returned. After a prenatal paternity test, a woman may feel some discomfort and/or light cramping. With the transcervical CVS test, some light spotting may occur. Discuss all risks with a physician before undergoing a procedure. Doctors may tell women to rest for a day before resuming normal activity. As with all medical procedures, there are some risks to the mother and fetus. Sometimes CVS and amniocentesis procedures are followed by a miscarriage. However, experts disagree regarding how many miscarriages were directly caused by the testing and how many would have occurred for other/unknown reasons. Some studies show that CVS has a lower risk of miscarriage than amniocentesis early in the pregnancy. So, for those who need to know their results within the first trimester, a CVS rather than an amniocentesis is used. In rare cases, CVS can be linked to defects in fingers or toes if performed before the ninth week of pregnancy. These tests are often not covered by most insurance providers. 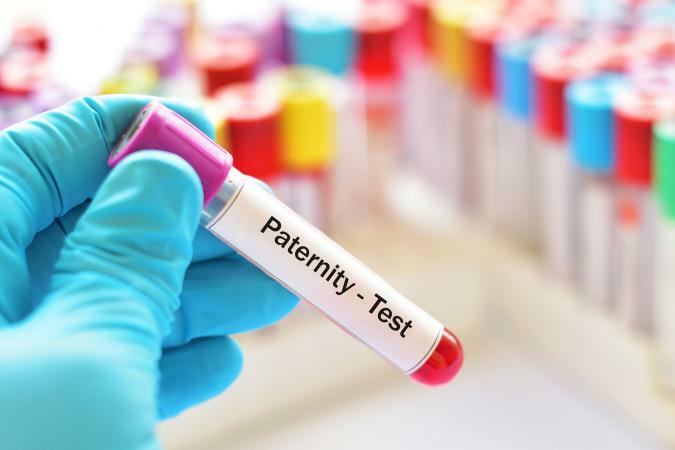 Paternity testing alone is not considered a medical necessity. However, if testing for other genetic and chromosomal disorders, the fluid can be then used to do the prenatal paternity test. Some insurance companies may then cover the cost of the procedure, but not the paternity test. Check insurance plans, hospitals, and labs to be sure of the costs involved before undertaking a CVS or amniocentesis solely for paternity reasons. Testing after birth may be much less expensive.